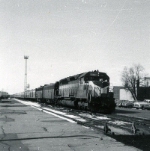 Description: GN train 28, the eastbound Western Star, arrives at Grand Forks depot on 5 Feb 1970; if on schedule it's about 1110 in GFND. The Star is led by an SDP45 and two F-units, which were pretty much normal power east of Havre Montana at this time. Once the BN merger was consumated Burlington Route E-units became standard through here, usually with an ex-GN F3 or F7B in the middle. The train has come from Seattle and, when done at the downtown depot, will back out just over 2.5 miles to the wye at PA Jct before turning south and heading for Fargo, Minneapolis and points east. Scanned from an Instamatic print.